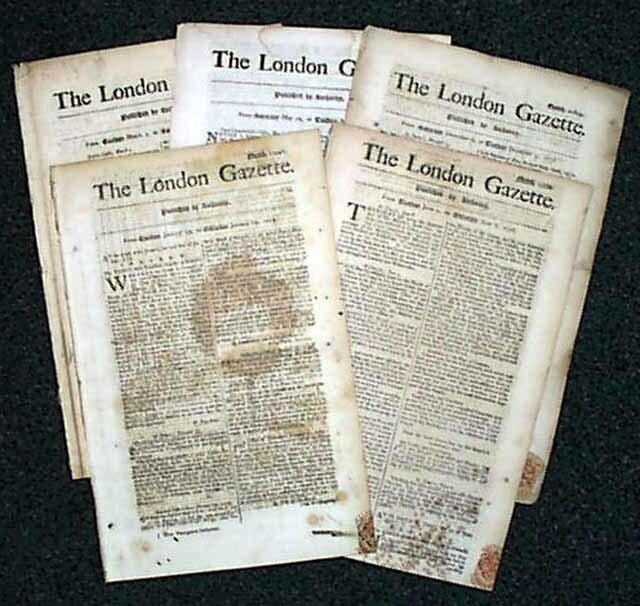 Item # 559411 THE LONDON GAZETTE, a lot of five (mostly) 2nd-rate issues of this famous newspaper, one each from 1777, 1778, 1779, 1780, and 1781, covering 5 years of the Revolutionary War. Although no direct war content is to be found, they are great period items giving a nice perspective of life during this formative period in world history. Most are 4 pages, and measure about 8 by 11 inches. The image shown is only representative what the type of issues you will receive. Actual issues will vary from set to set.